Eighty years ago, Harvard researchers set out to unlock the secret to longevity. What began as following 268 Harvard sophomores through the Great Depression has blossomed to become one of the most comprehensive studies to date on emotional well-being. The Harvard Study of Adult Development has shown that health has many contributing factors, but one rises above the others in its power to make us happier and extend lives: our relationships (Vaillant, McArthur, & Bock, 2010). Relationships are our armor when life throws curveballs, fortifying our mental and physical health. In my role as a social worker who works as a therapist for people of various ages and genders with eating disorders, I regularly see firsthand the benefit of healthy relationships for my patients. Though National Social Work month may have just passed, we need to keep the drumbeat going to raise awareness about the 30 million Americans that will have an eating disorder in their lifetime (National Eating Disorder Association, 2018). These conditions can lead to serious mental and physical consequences. In fact, research has shown that eating disorders have a mortality rate among the highest of any psychiatric disorder (Arcelus, Mitchell, Wales, & Nielsen, 2011). They also commonly co-occur with substance use disorders and trauma. Social workers play an integral role in the treatment of those with eating disorders such as anorexia nervosa, bulimia nervosa, and binge eating disorder in part by providing direct clinical care and encouraging connectedness. Our role can also include activism and advocacy aimed at decreasing harmful appearance ideals and speaking up about the importance of addressing weight stigma as part of our field’s larger commitment to social justice. Eating disorders can be extremely isolating illnesses and recovery requires support, encouragement, and ongoing motivation. Individuals with eating disorders and their loved ones can find hope and help in others who understand what they’re experiencing. A 2004 qualitative study of women who were in eating disorder recovery found that many of the participants purposely isolated themselves amid their eating disorder. This social withdrawal, combined with irrational thinking and the need for control, exacerbated the severity of the eating disorders. In the same study, the women shared that the acceptance of a relationship with a loved one was essential to their recovery because it provided unconditional love, support, trust, and hope (D’Abundo & Chally, 2004). Additionally, a 2017 study reported that as many as one in four transgender youths engage in at least one disordered eating behavior, often triggered by incidents of feeling stigmatized. However, social support from family, friends, and peers conferred a protective effect, lowering the percentage of trans youth engaging in binge eating from 71% to 40% (Watson, Veale, & Saewyc, 2017). Support groups can be another way to strengthen recovery skills, providing a sense of shared identity for those living with eating disorders, as well as increasing a person’s mental capacity to protect his/her own well-being (Best et al., 2016; Dingle, Stark, Cruwys, & Best, 2015; Read, Morton, & Ryan, 2015). These groups also provide protection against bias and stigma, offering a safe space for those in eating disorder recovery to express themselves (Best et al., 2016; Read, Morton, & Ryan, 2015). Additionally, family therapy is a treatment modality that is a proven tool in effectively contributing to recovery. Parents, spouses, siblings, and other loved ones can make a world of difference for someone with an eating disorder. 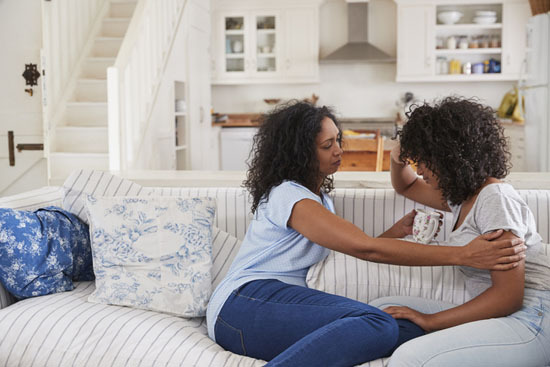 Family therapy allows the family and the person with the eating disorder to learn how communication, managing conflict, and tolerating negative emotions can aid in recovery. Helping a loved one through the process of recovery from an eating disorder can feel all-consuming. It’s important for caregivers to stay connected to their own friends, seek out their own support, and set aside time to replenish themselves emotionally. Guilt, shame, frustration, sadness, fear, and anger are just some of the emotions commonly expressed by people when someone they love is struggling with an eating disorder. While each family experiences an eating disorder—and the recovery process—in a unique way, there can be commonalities that are important to talk about. Attending support groups for caregivers and educational workshops facilitated by treatment professionals can help people to gain understanding and insight into their loved ones’ difficult journey, enabling family and friends to get feedback and support around their own feelings while they help their loved one navigate their way back to health. The Collaborative Care Skills Training Model, often facilitated by social workers, is a great example of a resource that empowers parents and caregivers in this role. Research indicates that this approach improves both carer and patient well-being (Treasure, Rhind, Macdonald, & Todd, 2015). Social workers offer a range of services that support people in eating disorder recovery and their loved ones. In our role, we often work as therapists in the inpatient and outpatient settings and provide individual, group, and family therapy. As therapists, we use evidence-based treatment approaches such as family-based treatment, cognitive behavioral therapy, and dialectical behavior therapy to provide appropriate skills to our patients. Social workers also act as conduits for patients, connecting them to resources outside of treatment and to family and friends that can aid in treatment. It’s worth noting the caveat that simply being connected socially isn’t enough to aid in recovery. The type of support that a person in eating disorder recovery receives is also important. A 2012 qualitative study of women in eating disorder recovery found that the following types of support were among those that aided recovery: reconnection, close relationships, statements of support, empathetic friends, and compassion (Linville, Brown, Sturm & McDougal, 2012). Participants further noted that recovery was hindered by family members not fully understanding the eating disorder; family members often focused on food intake, claiming that if the participants simply ate more, they would be “fixed.” The participants noted a desire to talk openly about their eating disorders but not feeling comfortable to do so (Linville, Brown, Sturm, & McDougal, 2012). As social workers, we strive to ensure that the social support a patient receives is the right type of support. We educate people about the best ways to engage in conversations with loved ones who may have an eating disorder and how to continue engaging in open and helpful conversations throughout the treatment and recovery process. For us, offering and encouraging meaningful conversations—and supportive, recovery-focused family meals—is the crux of what we do as therapists for those struggling to overcome eating disorders. Helping people with eating disorders and their loved ones successfully navigate through eating disorder recovery is at the heart of what I do and what keeps me going every day. Helping each individual and each family connect in new ways and utilize their unique strengths to overcome eating disorders is incredibly fulfilling, and I am grateful to have the opportunity to do this for a living. — Dina Wientge, LCSW-C, specializes in family-based treatment and family therapy at The Center for Eating Disorders at Sheppard Pratt, an eating disorder treatment program located in the Baltimore area. Best, D., Beckwith, M., Haslam, C., Haslam, S.A., Jetten, J., Mawson, E., & Lubman, D. I. (2016). Overcoming alcohol and other drug addiction as a process of social identity transition: The social identity model of recovery (SIMOR). Addiction Research & Theory, 24(2), 111-123. D’Abundo, M., & Chally, P. (2004). Struggling with recovery: participant perspectives on battling an eating disorder. Qualitative Health Research, 14(8), 1094-1106. Dingle, G. A., Stark, C., Cruwys, T., & Best, D. (2015). Breaking good: Breaking ties with social groups may be good for recovery from substance misuse. British Journal of Social Psychology, 54(2), 236-254. Linville, D., Brown, T., Sturm, K., & McDougal, T. (2012). Eating disorders and social support: Perspectives of recovered individuals. Eating Disorders, 20, 216-231. National Eating Disorder Association (NEDA). (2018). What are eating disorders? Retrieved from https://www.nationaleatingdisorders.org/what-are-eating-disorders. Read, S. A., Morton, T. A., & Ryan, M. K. (2015). Negotiating identity: A qualitative analysis of stigma and support seeking for individuals with cerebral palsy. Disability & Rehabilitation, 37(13), 1162-1169. Treasure, J., Rhind, C., Macdonald, P., & Todd, G. (2015). Collaborative Care: The New Maudsley Model. Eating Disorders, 23(4), 366-376. Vaillant, G. E., McArthur, C. C., & Bock, A. (2010). Grant Study of Adult Development, 1938-2000. Harvard Dataverse, V4, https://doi.org/10.7910/DVN/48WRX9. Watson, R. J., Veale, J. F., & Saewyc, E. M. (2017). Disordered eating behaviors among transgender youth: Probability profiles from risk and protective factors. International Journal of Eating Disorders, 50, 515-522.